Durham’s been the home to innovation and forward-thinking for more than 150 years. From the invention of BC Headache Powder and the first sit-ins of the Civil Rights movement, to Research Triangle Park’s innovations of the barcode, AZT, 3D Ultrasound, and LED lighting over the years –Durham has always found ways to push the envelope. With more tech and life science start ups than ever, we’re excited to see what the future brings and how Durham-based innovators will shape it. We’re the ‘Tech Startup of the South,’ grounded in the values of shared prosperity, ready to grab the bull by the horns for the next 150 years. Durham’s future is already bright – but we don’t want to settle. 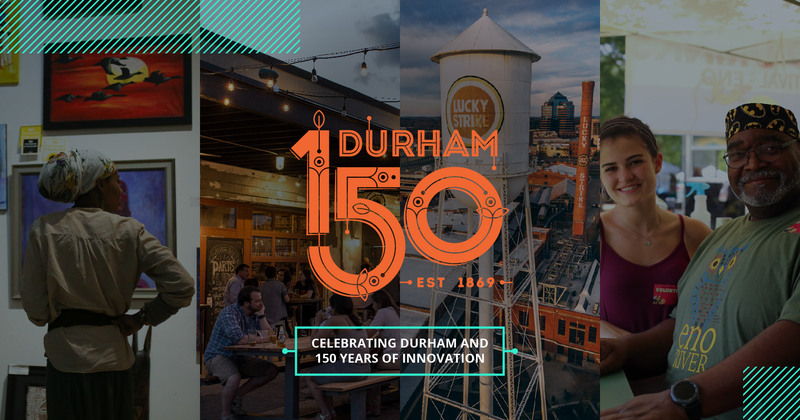 Throughout the 2019 calendar year, there will be more than 150 events and projects put in motion to make Durham a better, more equitable community in the future. From planting more trees to providing racial bias and sensitivity trainings, Durham 150’s messaging and activations will encourage open-source civic engagement. We’re proud to the ‘Tastiest Town in the South,’ but let’s make sure there’s food security for all. Let’s figure out how we can use resources more effectively and build trust in the community. Let’s work toward shared prosperity so the next generation thrives and continues to be a progressive, welcoming community. Together, we’re excited for what’s to come. In Durham, new conversations are started every day. To join in the conversations and efforts that encourage shared prosperity is to strengthen our present community and build a better future. See all projects to find out how you can get involved and figure out how you can contribute. We want to hear from all corners of the community, from groups big and small, to learn more about what projects and efforts will help make Durham better. Have an idea or project in mind? Let us know, and we’ll figure out how we can help.